In 2011, via the NEWSIRE section, The Onion ran the following headline – “23 Webby Awards Melted Into One Pulitzer.” Was it wishful thinking or sly, spot-on presaging? We ask because The Onion is now just two short of this high-temperature, trade-up plateau. Per today’s announcement of 2014 Webby Award winners, the satirical site racked up record 20th and 21st honors from the International Academy of Digital Arts & Sciences (IADAS) for Social Content and Marketing/Humor and General Website/Humor. In terms of Onion headlines between now and the 18th Annual Webby Awards ceremony Monday May 19, there’s always the Spider-Man angle. How can a guy who spins a web to catch thieves not be able to catch a Webby for website, mobile, social media, something in a big sequel year. 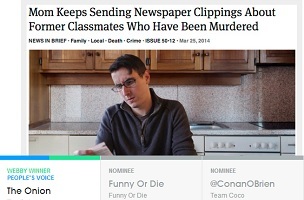 Barring that, maybe The Onion can tackle the fact that in 2014, there are, overall, 185 Webby winner categories and another equal amount of People’s Voice kudos. Suddenly, that 20/21 mark doesn’t seem so melt-worthy.